Fix deposits being one of the safest investment options many opts or same, but sometimes wonders how to find out which bank pays highest rate of interest on fix deposit. If you are one among this you are at right place we are herewith comparison table of fixed deposit interest rates for all popular banks India. These interest rates has updated on 5th July, 2013. 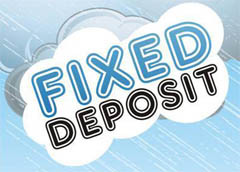 In fix deposit you have two different choice normal fix deposit (Taxable) and tax saving fix deposit. By default income accrued as interest on bank deposits is considered as taxable income & this interest earned is taxed as per the tax slab rates of the individual. For example, consider an individual who accrues an interest of INR 15,000 in a financial year. If the individual is in 20% tax bracket, 20% of INR 15,000 is charged and a 3% cess is charged on it. Generally the tax is deducted at the source. You can avoid tax on fix deposit by submitting Form 15G or Form 15H. If your Income tax 80 C tax savings limit are not yet exhausted you can invest in tax saving fix deposit, remember tax saving deposit offer higher return but it is like locking money for longer period for fix return. « Gold as Investment Good or Bad?